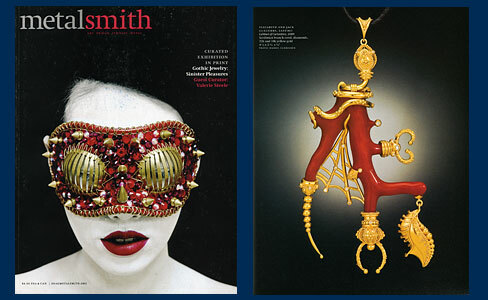 “Gothic Jewelry: Sinister Pleasures” was the theme for Metalsmith magazine’s 2012 Exhibition in Print. The guest curator was Valerie Steele, the director of the Museum at the Fashion Institute of Technology in New York. Following the publication of the Exhibition in Print, a select group pieces formed a traveling exhibition showing first at SOFA Chicago, November 2-4, 2012, and then on to the National Ornamental Metal Museum in Memphis, Tennessee, for an exhibit running December 7, 2012 through March 10, 2013.